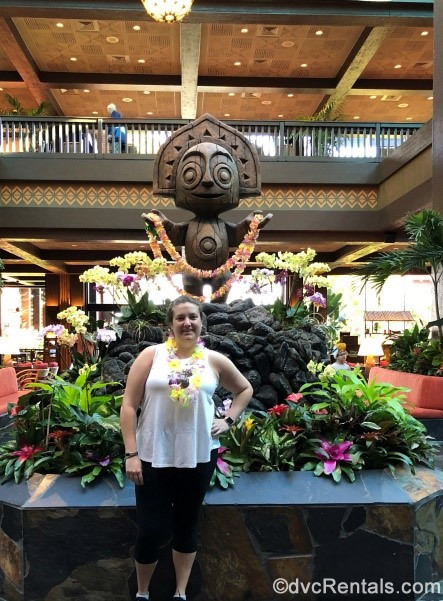 I arrived at Disney’s Polynesian Village Resort with my younger sister who had just graduated from college. I promised her a sister’s trip as her graduation gift, and she wanted to go to Walt Disney World and stay at the Polynesian Resort because “Stitch (her favorite character) lives there.” I wanted to stay at the Polynesian Resort for its convenient location to the transportation center and the Magic Kingdom and to experience a Deluxe Disney Resort and all it has to offer. The Polynesian did not disappoint. Our check-in experience at the resort was so smooth. I checked-in on the My Disney Experience app about a week before our trip. When we arrived at the airport in Orlando, we went straight to the Magical Express and were immediately boarded onto a bus for our resort. We had tagged our checked bags with the luggage tags provided by the Magical Express and left them at baggage claim for a cast member to collect and bring directly to our room – this is a great service as it allowed us to focus on enjoying the resort and heading to the parks instead of fighting with our luggage. While on the bus to the resort, I received a text message stating that our room was ready. It was only 9:30 AM so I was surprised that our room was already available. We decided to go check out the room and drop our backpacks before heading to the Magic Kingdom. You really can’t help but get excited as you pull up to the Polynesian. You can see the monorail running right above you, and the entryway to the main door is beautifully landscaped with tropical flowers and water features. The landscaping all around the resort makes you feel like you are on a tropical island getaway. 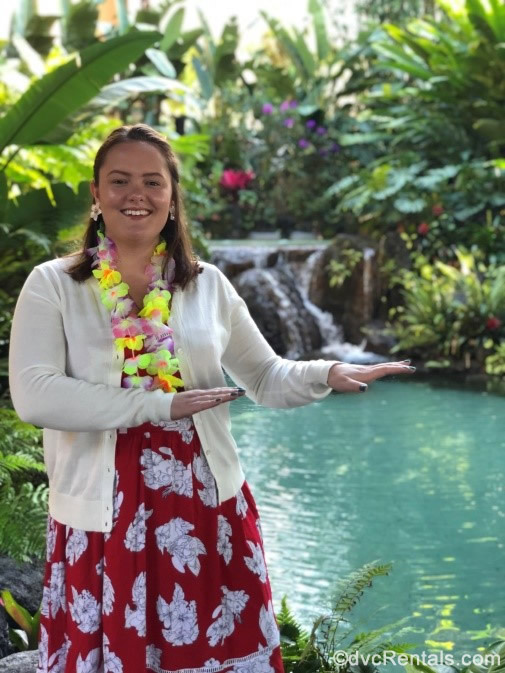 As you walk in the front door, a cast member is there to greet you and place a lei around your neck, making you feel right at home. The lobby is very spacious, open to the upper level, and is a hub of activity. We had already received our room number via text message, but the Polynesian is a large resort made up of several different buildings so I asked the concierge for directions to the room and he drew us a map and explained the different routes we could take from the main building – he was very helpful. After about a two minute walk, we arrived at our room. Our magic bands opened the door with no issue. We walked into a spacious studio with a queen bed, a sofa, a table with two chairs, and a large TV. The cabinet under the TV pulled out into a bed and displayed a beautiful scene from Lilo and Stitch on the wall. To our great surprise and delight, the studio’s bathroom is split into two sections! One had a strikingly tiled waterfall shower and sink and the other had a tub/shower, sink, and toilet. We also had a patio with two chairs and an exotically landscaped “yard.” I booked the standard view studio, so our view was of the parking lot, but given how spectacular everything was, we didn’t mind the view at all. My sister and I took advantage of all the amenities the resort has to offer. 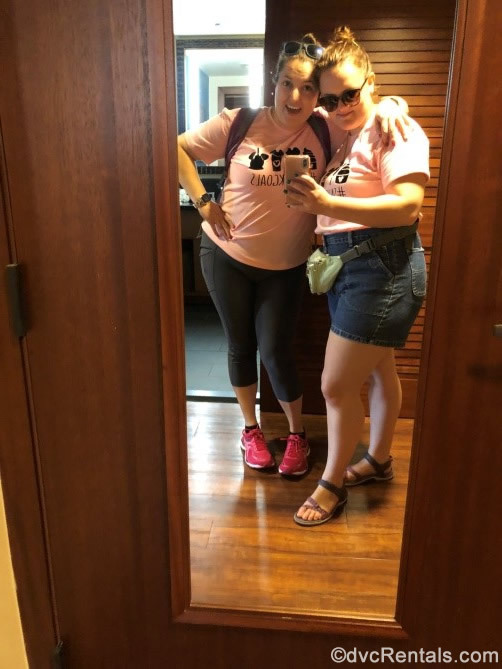 We visited both gift shops, got a drink at the lobby bar, a Dole Whip at Pineapple Lanai, and ate at both Kona Café and ‘Ohana. It was rainy on our trip, and the convenient location of the Polynesian made it easy to stop by the room and change to dry clothes while park hopping. While stopping to change we visited Kona Café for dinner one night. Kona Café is a casual restaurant open to the second floor of the lobby. The food and service both met our expectations, and we didn’t have to wait for a table. We visited ‘Ohana on the last day of our trip for breakfast with Lilo and Stitch before we checked out. 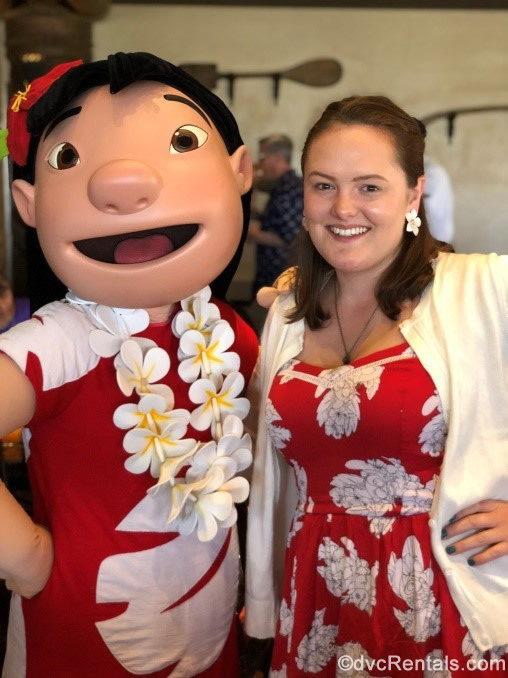 My sister was so excited for the breakfast, she wore a meticulously planned Lilo outfit, and we took photos of her all around the resort. The first thing that strikes you when you enter ‘Ohana is the spectacular view of the lake, the Grand Floridian, and the Magic Kingdom. Breakfast begins with a delicious pineapple bread, and the rest of the meal is served family style; eggs, ham, sausage, Stitch waffles, biscuits, and a fruit tray. 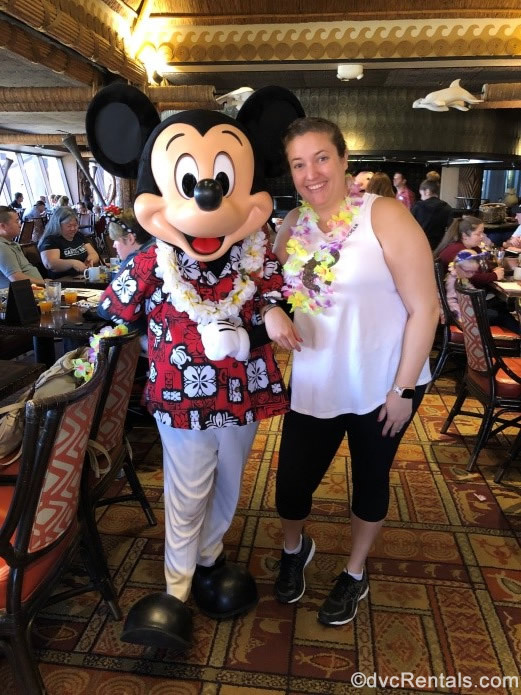 The best part – during breakfast you are greeted by Lilo, Stitch, and Mickey Mouse. Because it was chilly and rainy during our trip (we visited in February), and we only stayed two nights, we did not get to experience any of the pools on the property, but they looked like a great place to spend an afternoon. If you have always wanted to try a deluxe resort at Walt Disney World, the Polynesian is an excellent choice!